Family Friendly, Clean Condo Close to the Beach and Bay! New with modern conveniences. 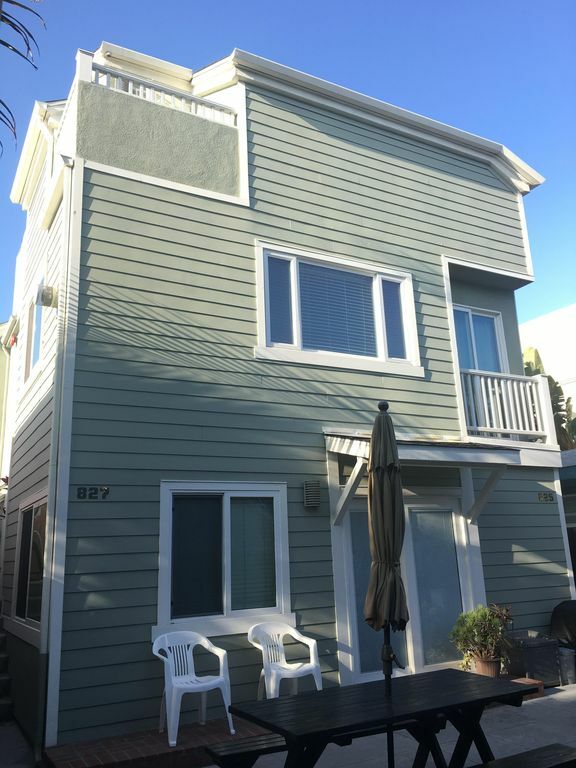 Stainless steel appliances, granite counter-tops, overhead shower heads, front loading clothes washer and dryer, gas fireplace, central air-conditioning, flat screen TV, WiFi, attached garage with parking for 2 cars, roof-top deck and more! 20 minutes to the San Diego Zoo, 10 minutes to Sea World and across the street from the beach. This location is ideal for any type of getaway. Enjoy world class golf at nearby Torrey Pines or relax on our roof-top deck, the choice is yours! We have 2 units to choose from so if you have a large party, we can accommodate up to 14-16 people! This home is also available for a 9 month lease: September-May. Please inquire. Master bathroom has a separate bathtub and shower. The shower have 2 shower heads, one traditional on the wall, and one overhead. There are also dual basins in the master bathroom. We also have an outdoor shower. There are 2 units to choose from. You can rent out the entire property. If you have a large group, we can accommodate up to 16! We had a great time staying at this house. Parking was awesome for 2 cars and the layout inside is great for more than one family traveling together. 3 full bedrooms and 3 full bathrooms with plenty of space in each room. Great house! Beautiful, comfortable, modern and clean! This is a beautiful home located close to the beach and bay. Very clean and modern. We each had a room on a different floor (3 story) with our own bathroom which was quite enjoyable. Very quiet. I would highly recommend this property and would stay there again if the occasion arose. Beautiful house, very clean. Spacious rooms, comfy beds, and quiet. We were within walking distance to the beach and restaurants. Clean and modern, close to many places to eat and the beaches! We could walk a few minutes one way and be at the ocean, or a few minutes the other and be at the bay. That's if we wanted to leave the rooftop deck. We enjoyed our stay here, there was plenty of space for 4 adults. We walked to most of the places we ate, loved the convenience of the Olive Cafe on the corner for morning coffee and breakfast. Parking was convenient, and the owner was quick to respond when we had a little trouble with the wifi. This unit felt modern and clean like a hotel but with so much more space-I hope we get to visit again! Nicely upgraded, clean, private split levels, and close to everything around Mission. The home was clean, good location, and all of the amenities. Washer, dryer, AC, and comfortable beds made the stay that much better. Our home is centrally located to many activities in San Diego. We are about 20 minutes from the airport and Balboa Park and less than 10 minutes to Sea World. If golf is on your agenda, we are about 20 minutes to Torrey Pines. If dining and dancing are on your agenda we are about 20 minutes to the beautiful downtown Gas Lamp area. We have 2 matching units (front and back), so if you have a large group, we can accommodate! Off peak: $2650.50 Peak: $3459 Holidays : $3054.75 wk rates includes tax & cleaning) We have 2 units available to rent. If you have a large group, we can accommodate up to 16 people! Also available for 9 month lease during the off-peak times.